I love chicken salad. I also love pasta. Mixed together, it's amazing. My aunt makes this a lot for family parties, and I can't get enough! It's perfect for summer BBQs, parties, or even makes a great dinner. Cook chicken and cut into bite-size pieces. Cut up celery and grapes. It saves time to do this while the chicken and pasta are cooking. Mix together dressing and mayonnaise in a large salad bowl. Add in drained pineapple bits. 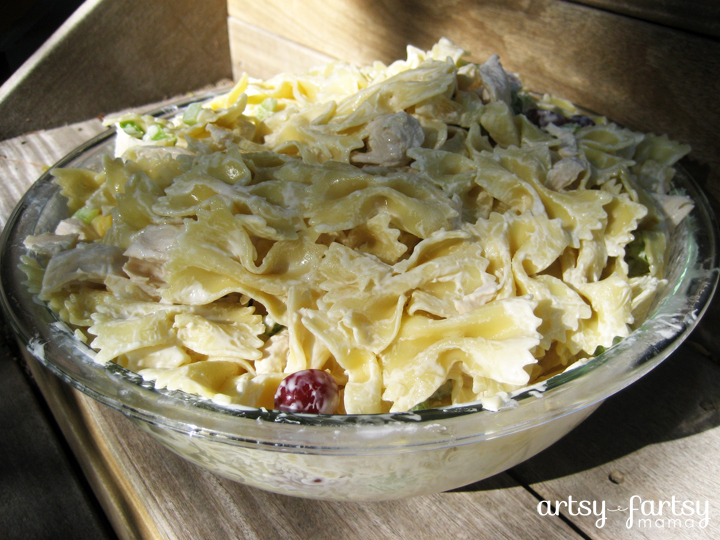 Carefully mix in the chicken, pasta, celery and grapes and stir until everything is coated. Cover and refrigerate. This salad is best served the next day. You may need to add a little more mayonnaise before serving. Mmm...cole slaw dressing on pasta salad! Sounds great!